Over the years, Christian Andreason has created *almost* every kind of music you can think of. Having professionally recorded hundreds of songs, Christian has so-far produced a total of 10 albums for his independent record label, Wonderboy Records. One of his most notable recordings is Christian’s GLAMA award winning song, “Everybody Else” which became one of the first songs played by US radio stations to commemorate World AIDS Day and the pandemic’s devastating effect on people everywhere. While Christian has been taking something of a break from the recording field over the past few years, he has recorded a new EP program recently entitled, “1000 Miles”. Also this year, Christian began performing in the off Broadway show, “The Gold”, while at the same time his song “Forever” (in 2009) became a top downloaded song, as it is played for weddings and wedding conventions all over the world. Another note worthy event was Christian's electronica/dance song, “Running Back to You -- HITPLAY Million Mile Mix” came in as 2008 finalist in the ever-popular ‘USA songwriting competition’ and ultimately was added to the playlist of several popular radio stations in Europe and Asia. Praised by celebrities, major press and even former United States Presidents, Christian’s music and messages have so far reached millions Internationally. Billboard Magazine recognized Christian as having been a “Critic's Choice” artist, printing that he and his music are “Sweeping!” And beloved Top 40 Radio DJ, Casey Kasem has said Christian’s talent is comparable to that of Elton John or George Michael. Fans of these artists, as well as Michael W. Smith and Joshua Kadison tend to vibe well with Christian’s music. And while music is certainly a strong focus within Christian’s life, there are also a few other “hats” he wears as well. But most notably, (other than doing music) spending time helping others advance in their personal and spiritual lives is probably what Christian is most known and respected for. So, whenever he is not creating and releasing music, touring, at home writing about spiritual issues or even helping people buy or sell real estate (he established his own real estate company in 2006), Christian spends several months out of every year focusing his energy on mentoring others as a intuitive life coach. Since 1995, Christian has assisted a multitude one-on-one. To find out more about Christian, you are welcome to visit his site: ChristianAndreason.com. 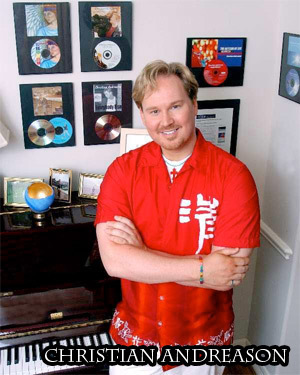 To book Christian Andreason, please contact Lisa Darden at lisa@huptalentandbooking.com or call 240-446-1554.